Getting a good result from surgery has a lot to do with the therapy that comes after surgery. How hard YOU work at therapy after surgery is as important as what the surgeon did during surgery. Bad results usually occur in patients who do not work at their therapy. You must work hard for many hours every day if you want the best results. Excellent results are seen in well motivated and dedicated patients who work hard with their daily home therapy. Do not rely only on scheduled therapy appointments to rehabilitate your hand. Remember, the therapist is your coach and you must practice on your own. You can not spend too much time on therapy! 24 hours around the clock would be perfect but not realistic. The absolute minimum is a full ½ hour 5 times a day. Progress will be SLOW. A bad injury or major surgery will make your hand stiff. It usually takes about 6 months to really loosen up scar tissue. Do NOT expect your hand to be "normal" after a bad injury or major surgery. After a bad injury or major surgery your hand will never be exactly as it was before. The goal however, is to get it as close to normal function as possible. Do these exercises below on every joint that is not in a splint. Do them every day. You will get more detailed instructions on how to work the joints that actually had the surgery. Don’t forget about your shoulder! The shoulder gets very stiff when any of the rest of the arm is injured. Reach all the way overhead like you are trying to touch the ceiling. Reach behind your back from below like you are trying to scratch between your shoulder blades. 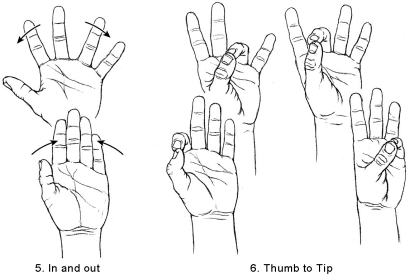 See the diagram for six simple hand exercises. 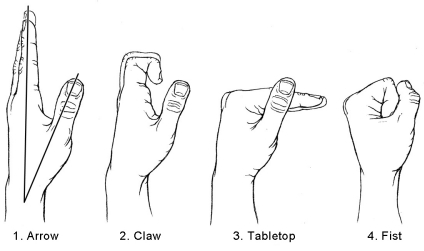 All 3 of the joints in the fingers and thumb interact with each other. It makes a difference what position one joint is in when you exercise another one. By doing each of the "six pack" exercises, you will make each of the joints in your hand move. 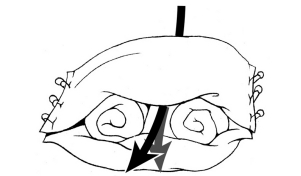 To maintain elevation of the hand while sleeping, use two standard sized pillows, six or eight large safety pins, and two rolled up bath towels. 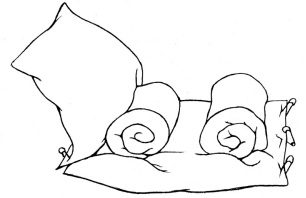 The forearm is placed between the bath towels inside the two pillows. You will be able to sleep on your back or on your side, hugging the pillows.